We have been providing work zone ITS systems since 2001. Recently we did a job on one of the most dangerous highways in the country. Not a week into the job we received a call from the prime contractor asking if we knew what the message boards said yesterday at 2:05 AM. We looked it up immediately sent it back with a time, date, & GPS location. The contractor let us know that there was a rear end collision and that information paid for the whole system for the rest of the 13 month job through reduced tort exposure. Once the job was done we learned that our system considerably reduced expected rear end collisions and there were zero fatalities. Our systems continually prove to decrease legal fees, prevent rear end collisions and for the collisions that do occur they are generally far less severe. In every study done by Caltrans, MassDOT, & Tex DOT they have shown that giving drivers real time information about queuing, merge points, and travel times, increases safety & efficiency and decreases driver frustration & legal fees. Scroll down to see just a few of the many applications. 26% of all traffic fatalities in work zones occur as a result of end of queue crashes. Queue warning systems are a proven, effective yet inexpensive way to reduce this number. One or more sensors measure traffic speeds. When they drop below a user defined level, software triggers messages on portable changeable message signs upstream of the problem warning drivers to prepare to stop. Our systems react in seconds. Messages upstream change to warn drivers in a minute or two giving them plenty of time to prepare and that reduces incidents and improves throughput. Our sensors are equipped with both cellular and satellite modems so the data will always get through ensuring dependable warnings and continuous data coverage. 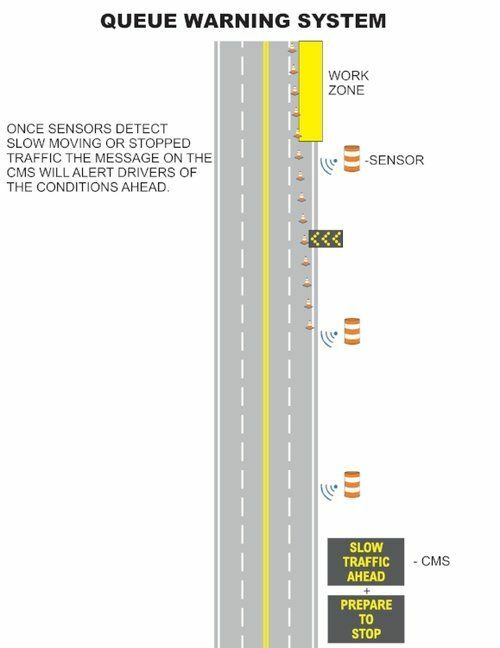 Lane merge systems are one of the oldest and tested ITS systems used in work zones. In rural, low volume areas they are used to move drivers into one lane early. This avoids conflicts, “road rage”, and improves traffic flow. In urban or more congested areas, lane merge systems are used to hold drivers in two or more lanes until the merge point to maximize capacity and give a little order at the merge point. 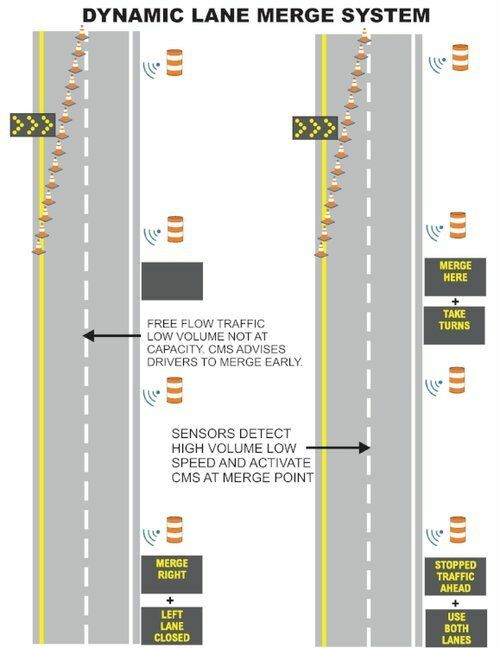 Dynamic lane merge systems encourage drivers to merge early when volumes are low and to stay in their lanes when volumes increase. Although these systems are very simple, experience is crucial in order to have an effective accurate setup for maximum effectiveness. Travel time systems report travel time from a sign to a popular destination such as “downtown” or the airport. Delay time systems report the expected average delay from that sign to a known destination, usually a popular interchange or cross road. Travel time is better for through traffic unfamiliar with the area. Delay time is better for local commuter traffic who can use it to evaluate other possible routes. Sensors collect speeds at various locations and use those to make the calculation which is then reported on message signs, websites, and through social media. There are many different types of travel and delay systems on the market today. We understand the unique requirements in work zones and how to best meet your goals on each job. Technologies that work in permanent locations don’t always work as well (or at all) in work zones. Work zones require a high level of granularity(something that we specialize in) in order to have real time information. This can be the simplest of all smart work zone designs. 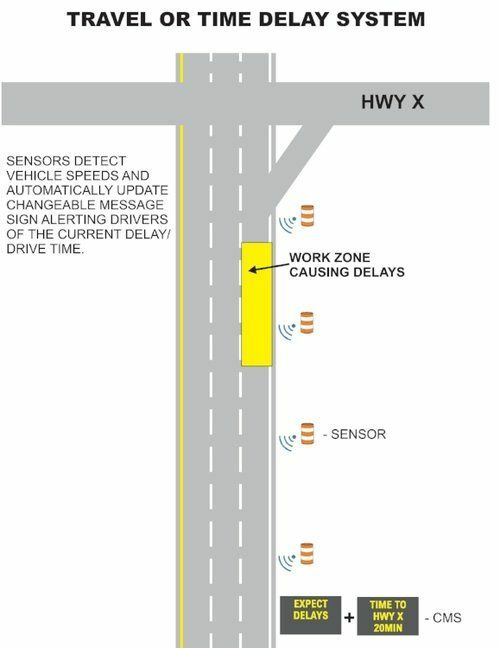 A sensor watches for construction traffic. A message sign upstream runs one message warning of road work ahead until a truck is detected approaching the entrance to the roadway. Then it changes the message sign to warn of slow trucks entering ahead. It can also specify the lane where they will be entering. 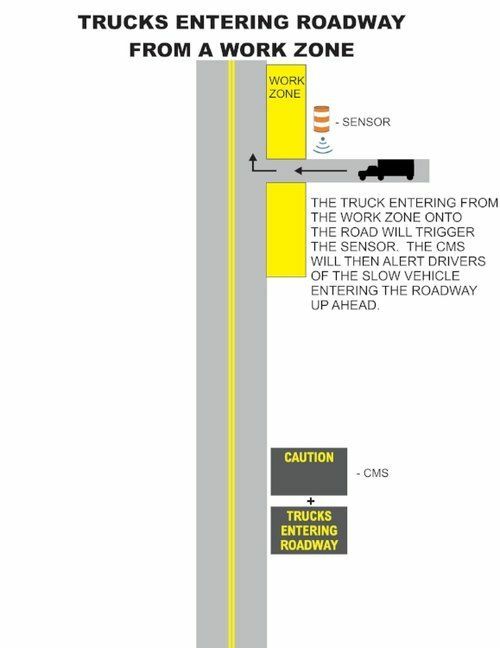 These systems are effective at reducing sudden lane changes and sudden rear in collisions within the work zone. Our entering / exiting system easily adapts to changing conditions in the work zone. As the work moves, it is simple and easy to relocate our system as needed. For unavoidably high impact jobs create an Alternate Exit or Dynamic Detour System, to spread traffic over different routes so that the roads that would that would otherwise be overwhelmed will be able to handle the increased volume by sharing the traffic impacts. The way it works is you designate multiple detour routes then you rate them in the order of volume capacity if the 1st route has a back up to a set point then the detour switches to route 2 once that route backs up past a set point the system will first look to route 1 if route 1 is still backed up then it will divert traffic to route 3. Login where ever and when ever you want to see traffic flows and what messages are being displayed to the public. We will send you customized reports that show traffic patterns, work zone impact & delay times. In addition we can create text message alerts to inform key personal of extreme traffic conditions. Some systems may not have the desired result when they are first deployed due to location, type of work performed or other environmental factors. We will not stop fine tuning the system until the desired outcome is achieved. Queue Warning System Consider telling a great story that provides personality. Writing a story with personality for potential clients will assists with making a relationship connection. This shows up in small quirks like word choices or phrases. Write from your point of view, not from someone else's experience.